Bringing world-class drifting to the Mid-West, the 2018 Formula DRIFT Black Magic Pro Championship and Link Pro 2 Championship headed to St Louis, MO for Round Six: Advance Auto Parts Crossroads presented by Rain-X. 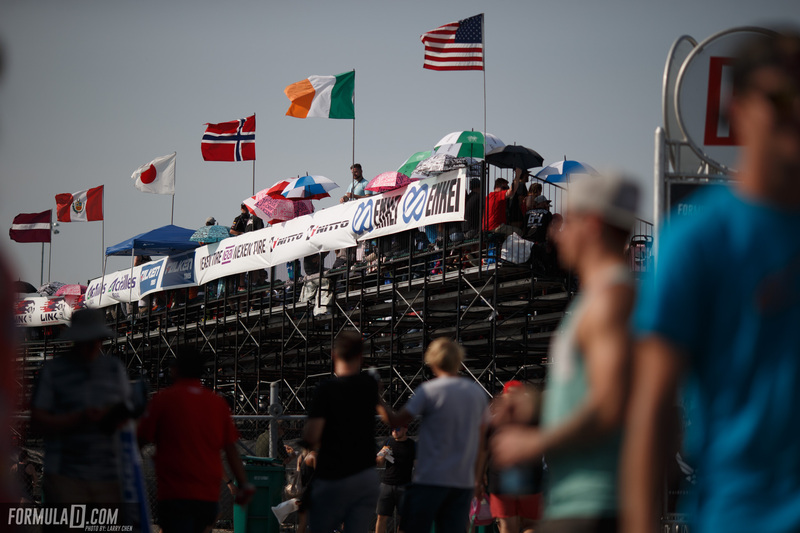 This would be the first time in its 15-year history the series had visited Gateway Motorsports Park in Madison, IL and packed grandstands greeted the competitors. 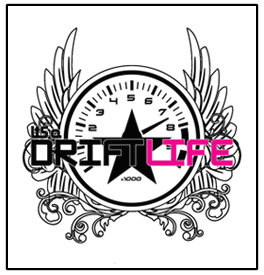 With so many drift fans to satisfy, Formula DRIFT brought both the Pro and Pro 2 categories to entertain the visitors. However, the drivers would have to contend with a new track to learn and a storm that blew in on Friday afternoon, washing out the Pro 2 heats. The weekend schedule was rapidly revised and fans would enjoy both the Pro and Pro 2 heats on Saturday during a packed 12-hour drift itinerary that started at 8AM. The Pro category was able to squeeze in qualifying before the storm rolled into Madison, IL but somebody who possibly hoped the weather would arrive sooner was Kristaps Blušs (Latvia) driving the HGK / Achilles Radial / MAST Motorsports / BMW E92 “Eurofighter”. He had an early impact with the tire barrier during practice, and would incur further damage just before qualifying began following a collision with Jeff Jones (USA) in the Doc / Falken Tire Nissan 370Z. With bodywork and suspension damage, an emotional Blušs returned to the pits as the team frantically made repairs. Jeff Jones was undamaged and qualified 22nd, while Blušs placed 14th, which should have come as welcome relief but was a long way off his second-place qualification at the previous round. Top of the Pro qualifying charts was Fredric Aasbo (Norway) in the Rockstar Energy Drink / Nexen Tire Toyota Corolla. 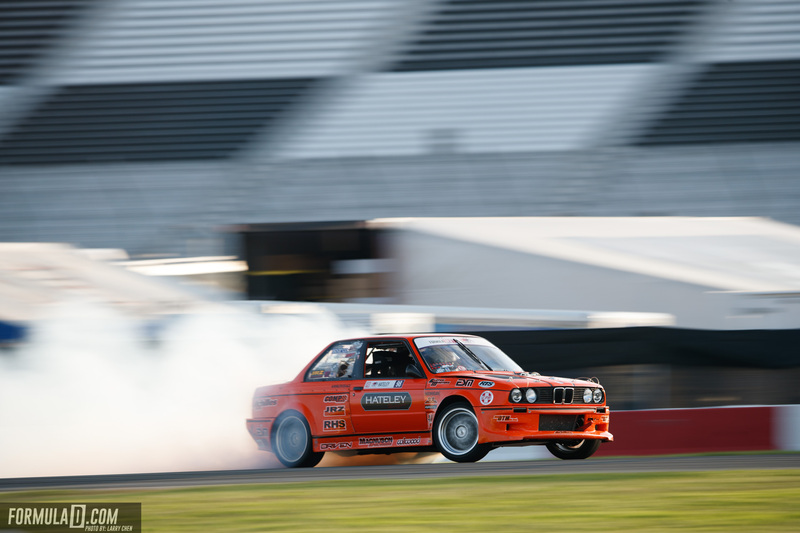 The 2015 FD Champion had relinquished his lead of the 2018 Formula DRIFT Black Magic Pro Championship for the first time at the previous round in Seattle, so the pressure was on him to perform. And perform he did, receiving 98 and 96 points, respectively, in his two qualifying runs out of a possible 100 points. Nobody could get close to Aasbo’s form on the new track, but first runner-up was Matt Field (USA) in the Wish / Borla / Falken Tire Chevrolet Corvette. He was followed by Kenshiro Gushi (Japan) in the GPP Toyota Racing / Falken Tire Toyota 86 who has been enjoying decent form over the past few rounds. Fourth place qualifier was Aurimas “Odi” Bakchis (Lithuania) in the Falken Tires / Maxxoil / Drifz Wheels Nissan S14, while James Deane (Ireland) put his Worthouse / Falken Tire Nissan Silvia S15 in fifth. 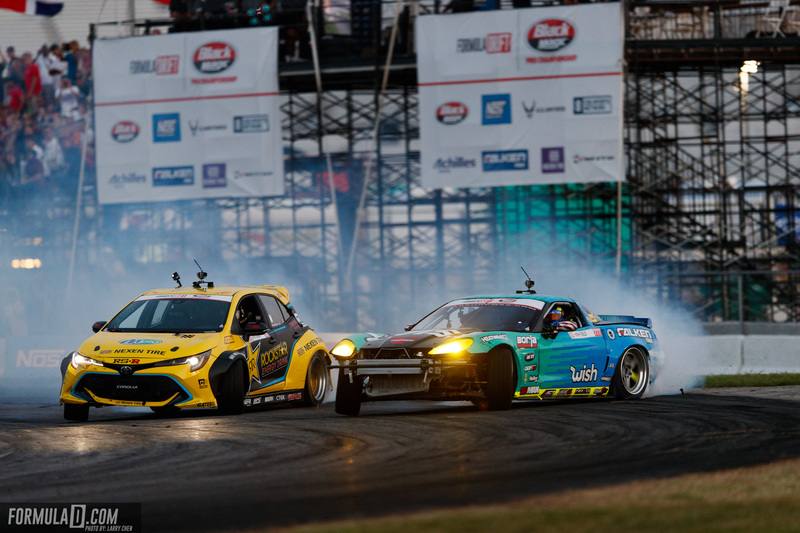 There was plenty of action and drama to entertain the enthusiastic fans at the inaugural FD St Louis round. With top qualifiers Aasbo, Field and Gushi getting bye runs, the Top 32 heats began with Matt Coffman (USA) in the Coffman Racing / Thunderbolt Racing Fuel / Achilles Radial Nissan 240SX S13. He hit a cone at the start of his run against Jhonnattan Castro (Dominican Republic) in the GPP Toyota Racing / Falken Tire Toyota 86. This forced the run had to be restarted but Coffman, the hometown hero at the previous Seattle round, was unable to restart his Nissan, even after a five-minute technical timeout, handing the win to Castro. Another restart was required between Forrest Wang (USA) in the Vapetasia / Achilles Radial / NRG Innovations Nissan S15 and rookie Kevin Lawrence (USA) in the Enjuku Racing / BC Racing Nissan S14.3. Struggling to repeat his second place finish at the opening round in Long Beach, Wang also struggled to exert dominance over Lawrence and the judges called for “One More Time.” This indicated it was impossible to find a winner after the first two runs, so the drivers repeated the runs and the decision went in favor of Wang. The victim of difficult practice sessions, Kristaps Blušs would also run “One More Time” in his Top 32 heat against rookie Kazuya Taguchi (Japan) in the Team Jerry Yang Racing / Top 1 Oil / Achilles Radial Nissan GT-R. Fortunately, Blušs was able to put Friday’s frustrations behind him and took the round win. Whether it was unfamiliarity with Gateway Motorsports Park or just the intensity of the competition, the weekend saw its fair share of spins and off-course incidents. None were more dramatic than Ryan Tuerck (USA) in the Ryan Tuerck Racing / Gumout / Black Magic / Nexen Tire Toyota 86. He had a big “moment” when he clipped the dirt and spun into the infield, handing the round win to his opponent, Vaughn Gittin Jr (USA) in the Monster Energy / Nitto Tire Ford Mustang RTR. Rookie Austin Meeks (USA) in the Committed Service Brand / Achilles Radial Nissan S14.5 would also spin on his run against series leader Deane, giving the Irishman an easy win. Similarly, Alec Hohnadell in the Rain-X / Permatex / Nexen / Hoonigan Nissan S14 would spin and lose to Jeff Jones. Also joining the spinners club was rookie Federico Sceriffo (Italy) in the FFF Drifting Department Ferrari 599 GTB Fiorano Drift Spec “Fiorella” who would hand the round win to Daijiro Yoshihara (Japan) in the Turn 14 Distribution / Falken Tire Subaru BRZ. It was a messy heat between Piotr Wiecek (Poland) in the Worthouse / Falken Tire Nissan Silvia S15 and Dean Kearney (Ireland) in the Oracle Lighting / Achilles Tire Dodge Viper. The Pole had to straighten up during one of his runs, while the Irishman had an off-track excursion and needed to take a five-minute technical timeout before the second run. The decision was eventually given to Wiecek by virtue of a better lead run. The final Top 32 casualty was Taylor Hull (USA) in the Comp Cams / Achilles Radial / Affirm Consulting / Borla Exhaust Cadillac ATS-V. He would fail to start, gifting the win to Odi Bakchis. Moving into the Sweet 16, the biggest story was 2010 FD Champion Gittin Jr heading off-track during his run against 2017 FD Champion James Deane. The Irishman would subsequently have to withdraw from the Great 8 with a blown engine when he was facing teammate Wiecek. With the Polish driver going through, Wiecek came up against Norwegian Aasbo in the Final Four. Following his top 32 bye round, Aasbo narrowly beat Castro in the Sweet 16, and then overcame three-time FD champ Forsberg in the Great 8. 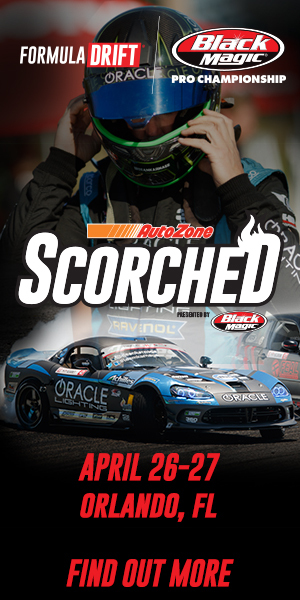 But Wiecek was determined to stop Aasbo’s progress and their runs were too close to call not once, but twice. The judges requested “One More Time” on two occasions, raising the fans to their feet as each driver demonstrated precision and speed. With six runs to choose from, the decision narrowly went to Aasbo who would face Matt Field in the Final. 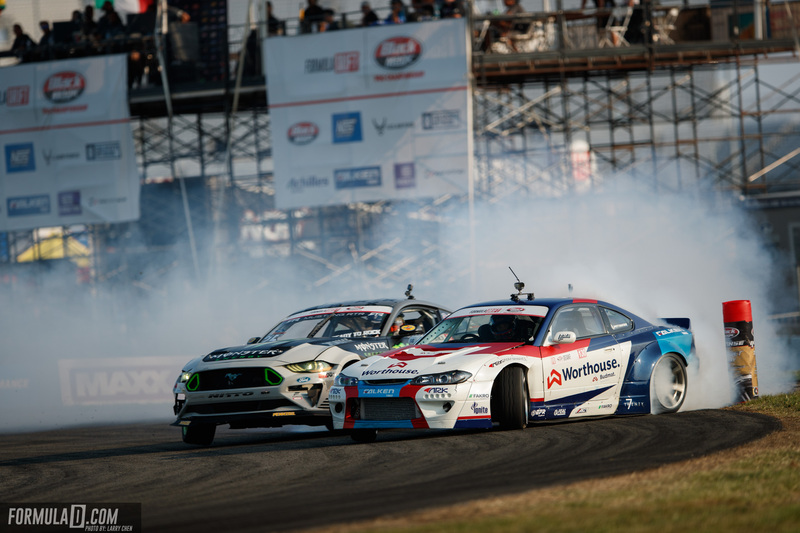 Field’s route to the Final had seen him beat Wang in the Sweet 16, Pawlak in the Great 8 and Chelsea Denofa (USA) in the Final 4 driving the BC Racing / Nitto Tire / Ford Performance Mustang RTR. Field wasn’t about to go down without a fight in the Final and used the power of his Wish / Borla / Falken Tire Chevrolet Corvette to keep on terms with Aasbo’s Rockstar Energy Drink / Nexen Tire Toyota Corolla. However, a small mistake by Field caused a collision and put him off the track, allowing Aasbo to claim the win. This was Aasbo’s second win of the season but his first since the opening round in Long Beach. It moves him within 30 points of Deane, who still leads the 2018 Formula DRIFT Black Magic Pro Championship, and opens a significant gap to third-placed Wiecek. 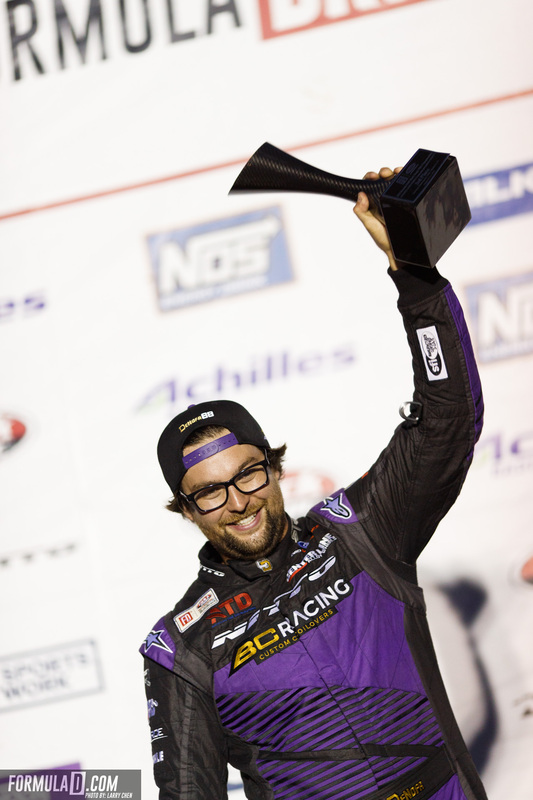 Matt Field’s podium moved Chevrolet above Nissan in the Formula DRIFT Auto Cup Championship for the first time in 2018. “We started the weekend on a new track with uncertainly. We didn’t know if the Corvette or the tires would last, but the team gave me a solid car and the Falken tires lasted every battle through to the finish. And that’s what gave us the edge to reach the Final,” Field enthused. 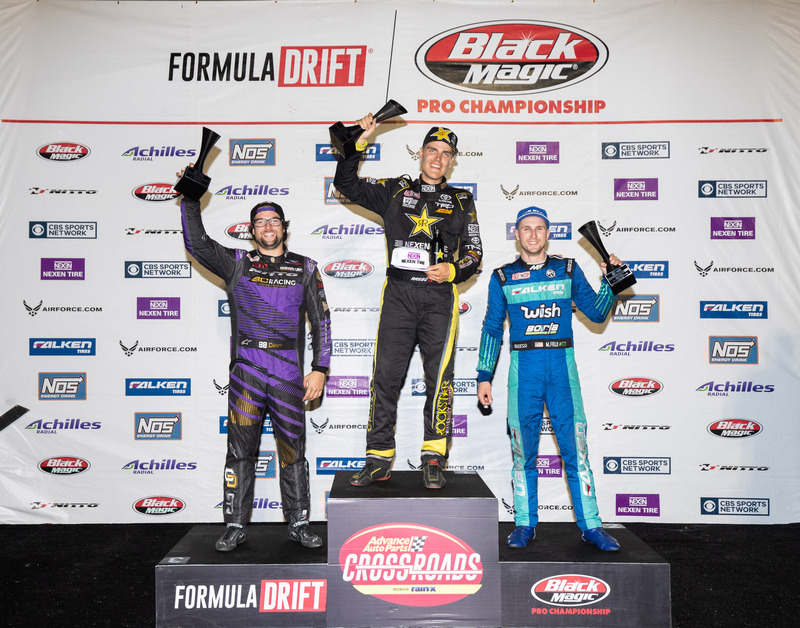 The podium at FD St Louis was also noteworthy since it was the first time either of the RTR Mustang drivers (Gittin Jr and DeNofa) had stepped up since 2016. In doing so, Denofa also gave Nitto its first podium since the opening round in Long Beach in 2017. “I’m super-stoked with third place and the team really deserved it after working so hard. I drove as hard as I could and got the result,” Denofa said. 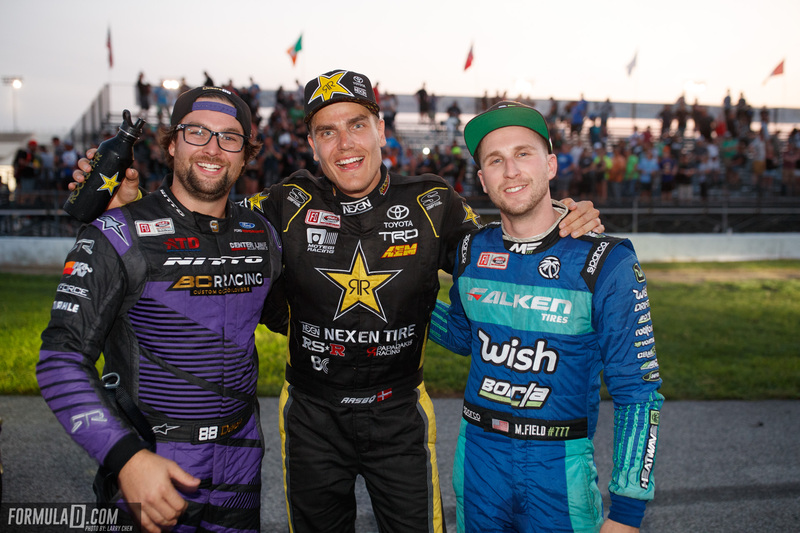 For drivers in the 2018 Formula DRIFT Link Pro 2 Championship, this was the second event of the year after Round One in Atlanta (May 11-12). The new St Louis track provided a level playing field for everybody and it was Riley Sexsmith (Canada) who rose to the top during qualifying in his NV Auto / Achilles Radial 2JZ Subaru BRZ. Qualifying second, one point behind Sexsmith, was Jonathan Hurst (USA) in the Dynosty Infiniti G37. Third place was taken by Pro 2 category leader, Ola Jaeger (Norway) in his Team Japan Auto / Nexen Tire Toyota Supra who was attempting to maintain his momentum from the Round One win. The biggest loser in Pro 2 qualifying was Kelsey Rowlings (USA) who collided with the tire barrier in his Top 1 Oil / Achilles Tire Nissan S14 and was, unfortunately, among eight Pro 2 drivers who failed to qualify for various reasons. With an unexpected delay caused by the inclement weather, the Formula DRIFT Link Pro 2 Championship teams were gifted additional time to work on their cars and tweak the set up. Anybody who wanted to sleep-in was out of luck because the heats began in earnest at 9AM sharp on Saturday. Having qualified in first place, Riley Sexsmith put himself in contention for the round win. 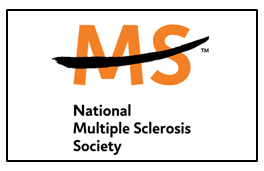 However, he fell at the first hurdle, losing in the Sweet 16 to Andy Hateley (USA) in the Hateley Motorsports / Achilles Radial BMW E30. 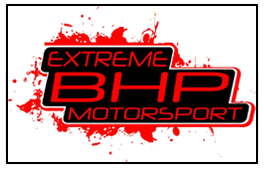 Hateley would, in turn, fall prey to Dylan Hughes (USA) in the Advance Auto Parts / Nexen Tire Nissan 240SX in the Great 8 round. The win put Hughes in the Final 4 against Brody Goble (Canada) in his Frankenstein Speed & Custom / Achilles Radial Nissan S14.75. It was a close contest but the decision went to Hughes, who progressed to the Final to face Travis Reeder (USA). Having qualified 14th driving his Achilles Radial Nissan 240SX, Reeder’s first opponent was Atlanta winner, Ola Jaeger. Despite qualifying a strong third, Jaeger failed to advance, allowing Reeder to progress to the Great 8 where he defeated Hooman Rahimi (USA) in the I’m Only Hooman / Achilles Tire Nissan 350Z. Reeder’s opponent in the Final 4 was Alec Robbins (USA) in the Koruworks / Achilles Tire Nissan 350Z. 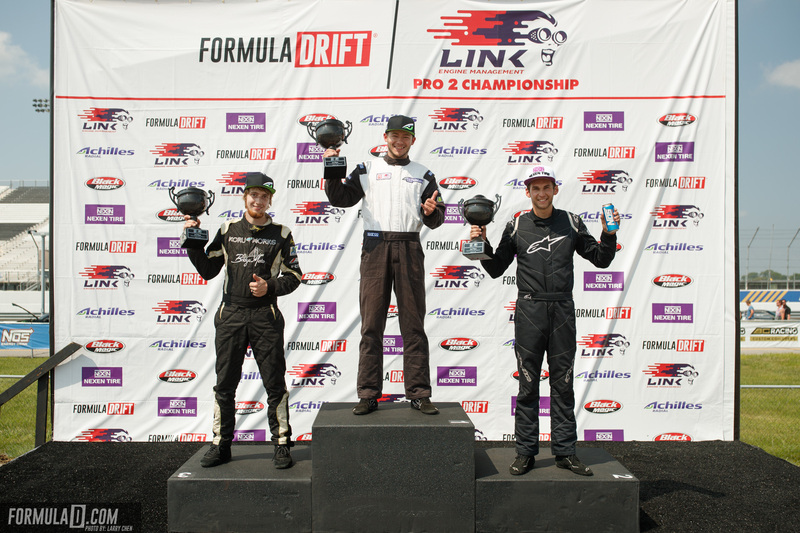 Robbins would lose but place third on the podium as Reeder swept to victory against Hughes in the Final, claiming the very first Formula DRIFT Link Pro 2 Championship win in St Louis. We caught up with a delighted Travis Reeder after he stepped away from the podium celebrations: “We had a killer weekend at St Louis, although we initially struggled with set up on this crazy new track. Once we got it figured out, we were able to string together some solid runs, stay consistent and make it to the top step. I want to thank my crew, family, friends and Achilles Radial – I couldn’t have done it without the help and support of everybody. This has been a great weekend and we’re stoked for the next round in Texas,” said Reeder. 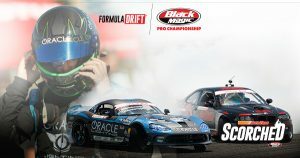 Round Seven of the 2018 Formula DRIFT Black Magic Pro Championship and Round Three of the Formula DRIFT Link Pro 2 Championship take place in Dallas, TX on September 14-15. Visit formulad.com for event details, ticket purchases, driver profiles and Livestream information. 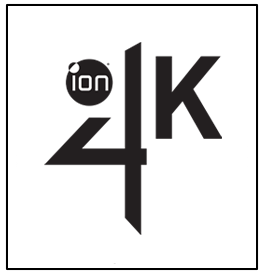 to go surfing and observe animations that demonstrate you how to work with it. and how they are going to get their purchases home.